Welcome to Bostonian Inn, your home away from home. We offer you the most economical rooms in the New Boston area. We are located off of I30, Exit 201. Our hotel is easily accessible to area business like Red River Army Depot, Telford Unit Correctional Facility, Ash Grove Cement, Timberline Speedway and Bowie County Court House. We are also a few miles away from Red River and Wright Patman Lake which offer great fishing and boating opportunities. We are surrounded by great restaurants and fast foods. Welcome to Bostonian Inn, your home away from home. We offer you the most economical rooms in the New Boston area. We are located off of I30, Exit 201. Our hotel is easily accessible to area business like Red River Army Depot, Telford Unit Correctional Facility, Ash Grove Cement, Timberline Speedway and Bowie County Court House. Get the latest forecast for weather in New Boston TX along with updates about temperature, humidity and more on Weather Underground. 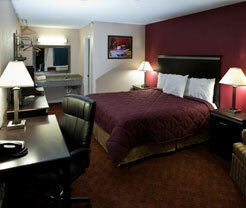 We offer 24 hours front desk, free high speed wireless internet access, Guest Laundry facilities. Room Amenities includes 32inch flat screen HD LCD TV, Coffee maker, MicroFridge, hair dryer, Iron, Ironing board. Enjoy the most refreshing, restful slumber imaginable with the Bostonian Inn Bed. This is the same bed you enjoy during your stay at Bostonian Inn, so you already know you love it. 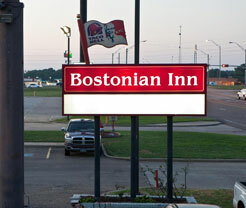 © 2012 Bostonian Inn Motel. All Rights Reserved.